Last week I was sent on assignment to Halifax, Nova Scotia* and stayed with friends. It was a glorious visit, and we made some pretty spectacular food, including a handmade orecchiette served with a pumpkin-almond-sausage-maple syrup sauce. There’s no better way to spend time with friends than making tiny pasta “ears” with your thumbs and drinking bottomless bottles of super Tuscans. While in Halifax, I had a chance to eat at the Wooden Monkey, a local institution that serves totally delicious food in a cozy environment. The food is also local, healthy and ethical to boot, but thankfully (and surprisingly!) they don’t make any compromises on flavour. A great example of that was their spectacular chocolate-tofu torte. A server was generous enough to share the ingredients with us, and while she didn’t give us proportions or techniques, we took it upon ourselves to try to replicate this outrageously rich-tasting and healthy dessert. 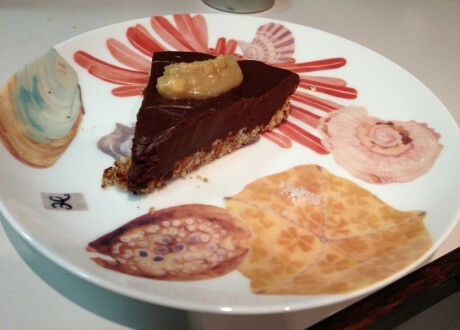 This is what she told us: semi-sweet chocolate, silken tofu, maple syrup and nuts. That’s it. For crust, blend nuts, butter and honey in a food process until it resembles crumbs. Press into a pie pan and bake at 350C for 10-15 minutes until golden. Check frequently to ensure it doesn’t burn. Remove and let cool. For filling, melt chocolate in a medium-sized bowl over a pot of boiling water or in the microwave. In the meantime, liquefy the silken tofu with a hand blender (this is key) and add the maple syrup, coconut oil if using and sea salt. Once the chocolate mixture is melted, fold in tofu mixture and blend well. Pour filling over pre-baked nut crust and smooth the top with a spatula or spoon. Once cool, refrigerate for at least 4 hours or freeze for 2. Serve with a nice dollop of maple butter and a small pile of fleur de sel on the side. The next day, we baked a whole pink trout filet on a bed of dulse, covered in lemon slices, and again the silken tofu came to the rescue. We needed a cream sauce, so blended the leftover silken tofu with lemon juice, olive oil, garlic, salt and pepper in a small pot. It separated slightly, but provided a tart-yet-unctuous counterpoint to the rich and salty fish and seaweed. That was served with a mixed wild rice blend and baby bok choi. Moral of the story? Next time you’re looking to make something, almost anything, that’s creamy, then consider silken tofu. I’m glad I gave it a chance, and so will you. *My husband and I recently relocated from Vancouver back east. Luckily, the Foodists family said they would be happy to keep me around, so I’m chuffed. All posts onwards will most likely be from the east coast.